The sudden loss of Steve Blake, who is out for six weeks or more after suffering a torn ulnar collateral ligament in his right elbow, leaves the reeling Lakers with no point guards. 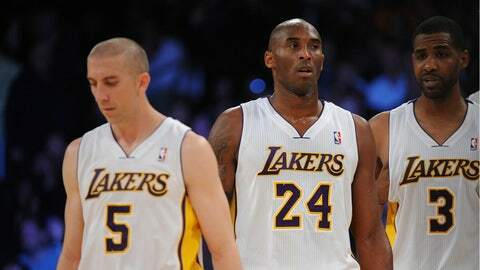 Video: One Timers: Kobe back? It’s not the best situation, but Bryant, whose return to the team is barely two games old, is capable of running the offense. In his season debut last Sunday against Toronto, he frequently brought the ball up the floor and finished with four assistants in 28 minutes. On Tuesday, he had three in 29 minutes against Phoenix. Blake reportedly suffered the injury Nov. 24 in a game at Sacramento, meaning he played two games with a torn ligament. Hearing that, Bryant called Blake "tough," a word that is often used to describe Bryant himself.